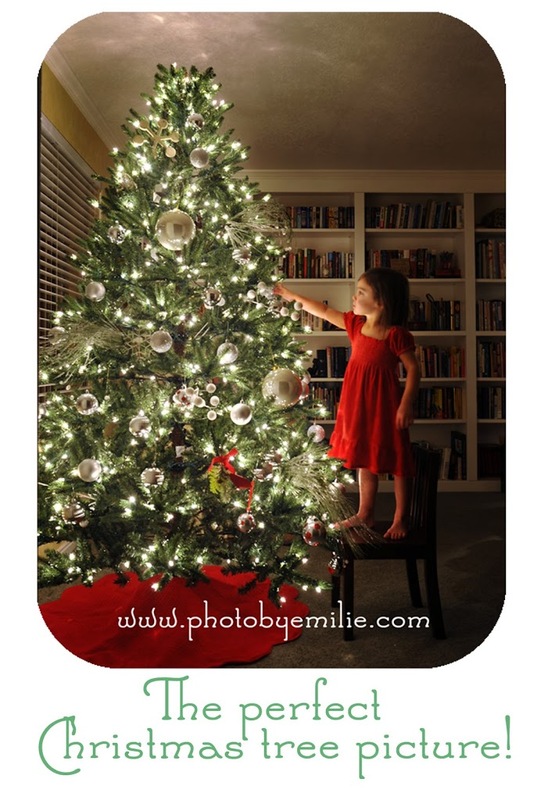 Capturing gorgeous photos of your Christmas tree is all about selecting the correct shutter speed. Shutter speed is the speed that the shutter opens, lets in the image and then closes. Shutter speed manages two elements of your photo: the amount of light in your image and the amount of motion captured in your image. 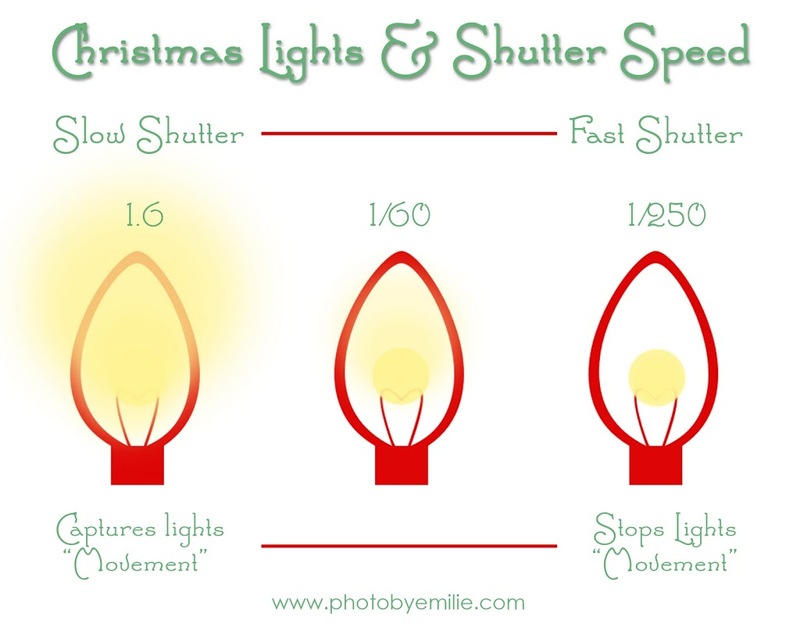 When the shutter speed is on a lower/slower setting the shutter is open a longer amount of time letting in more light. The slower the shutter speed the longer the shutter is open and the more light that is let in to create your image. When the shutter speed is on a higher/faster setting the shutter is open less time letting in less light. The faster the shutter speed the less time the shutter is open and the darker your image. 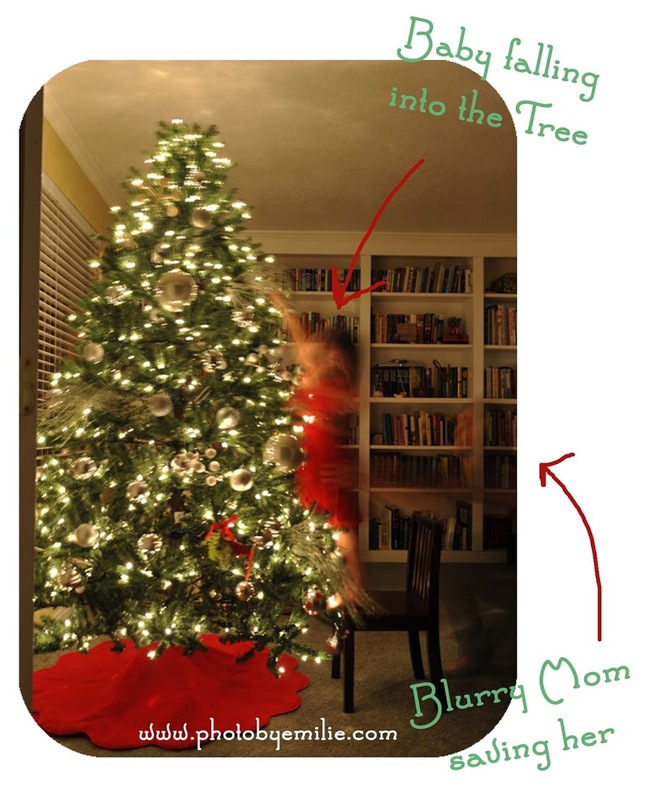 When capturing your Christmas tree you want to let in lots & lots of light so you would select a lower/slower shutter speed. When the shutter speed is on a lower/slower setting the shutter is open a longer amount of time capturing all the movement found in your scene. The slower the shutter speed the longer the shutter is open and the more movement that is captured in your image. When the shutter speed is on a higher/faster setting the shutter is open less time capturing a smaller amount of “time” in our scene, stopping any movement that is happening. 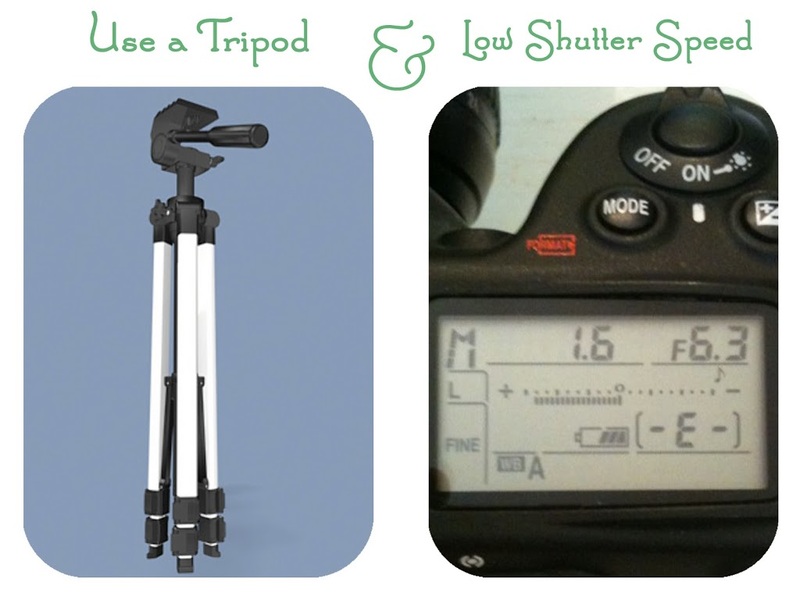 The faster the shutter speed the less time the shutter is open and the less motion is captures. The higher/faster the shutter the sharper your image. 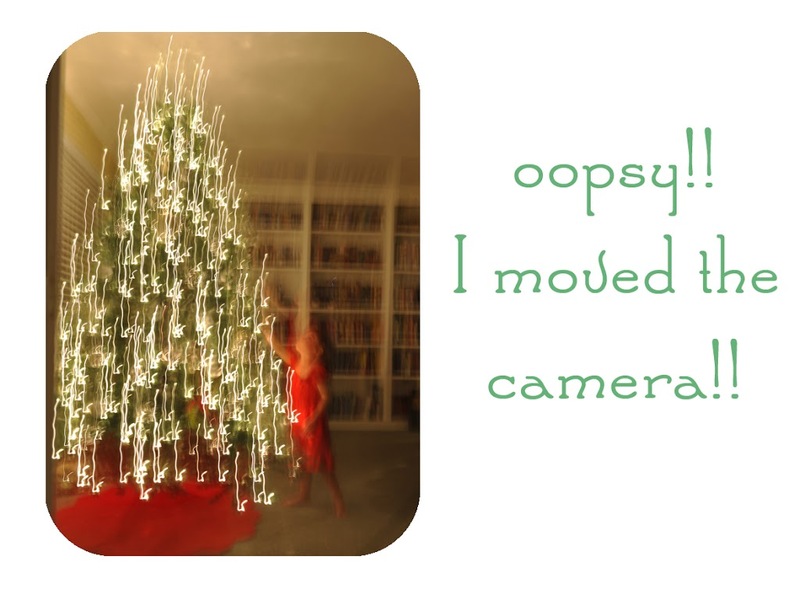 When capturing your Christmas tree you want to capture the “movement” of the lights so you would select a lower/slower shutter speed. Notice 2 things in the following images. 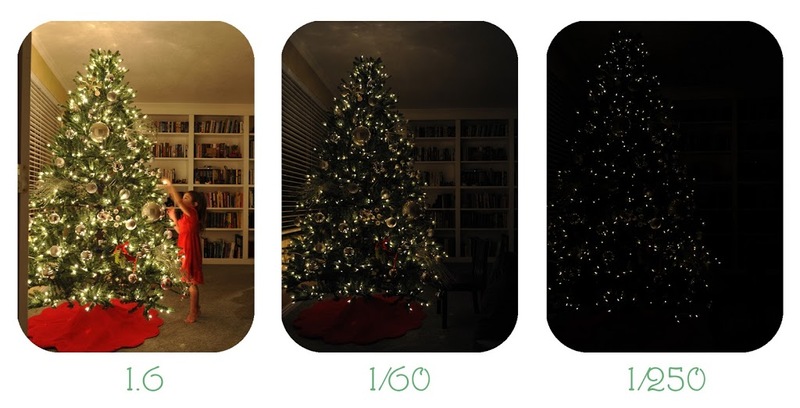 Notice as the shutter speed increases the images becomes darker, also notice that the bulbs get smaller. I couldn’t resist adding this next one. 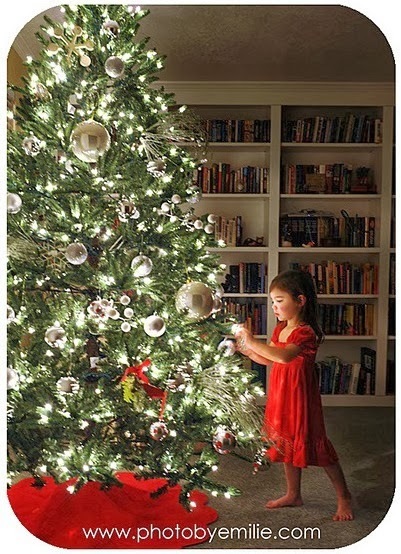 When I asked my baby niece to reach up to the top of the tree she lost her balance & in slow motion starting timbered into the Christmas Tree. My Sister In Law is one quick lady & caught her before she knocked the whole tree over. Of course I captured the whole thing on camera. Enjoy…. Oooooh thanx for sharing, I so want to do this now! I have a nice camera and never really use it or learn about it but now I’m going to give it a try. I hear you both, I’m getting a DSLR camera this month (finally)and am a little nervous to use it. I’m taking Emilie’s class in January and hopefully I’ll get the swing of it! She’s amazing. Great tips! And I love that she shared the little bit of action and rescue with the falling kiddo! Emilie’s class will BLOW YOUR MIND. She’s delightful, too. I tried the tree thing last night and it worked out well enough that I’m going to do it again with kids in actual clothing instead of ratty old mustache t-shirts. Great tips, but I don’t have a fancy camera 🙁 Any hope for us sad soles without good cameras? I have had pretty good luck just using the 8 mp camera on my smartphone and adjusting the settings available on that, which are often available on digital cameras as well…ISO is one way (it was film speed on a manual camera, but on digital, it *kind of* works like shutter speed), also, white balance, exposure, contrast, saturation and sharpness, plus the “scenes” function. Before involving people, especially little kids, play around with things and write down what works if you want to recreate it at another time. A tripod is still a god idea. excellent post – thank you! Wonderful post but I do admit, I LOVE the last picture, that is what memories are made of !